I took this photo for reasons other than recording information about Port Arthur. I have a particular fondness for things that grow where they shouldn’t—grass pushing up through asphalt, vines growing over a windmill, a plant slipping up through a crack in a sidewalk, and flowers like the one in this photo, just sprouting out of a stone wall. I have myriad photos of these “wall flowers,” as I love the juxtaposition of opposing elements. It reminds me that nature is designed to bounce back. Whether it’s Vesuvius burying Pompeii or Angkor Wat disappearing beneath a tidal wave of greenery, nature wants to win and will take back anything we leave alone for too long. 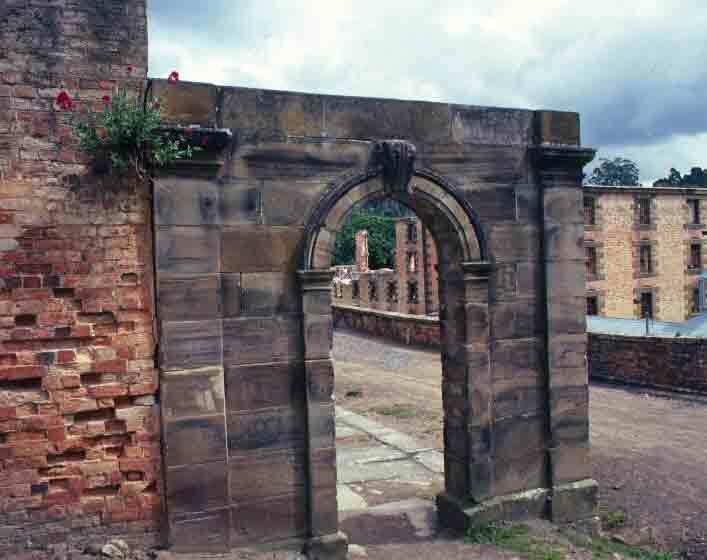 And so I had to include the wall flower in this photo of an arch framing the penitentiary at Port Arthur. 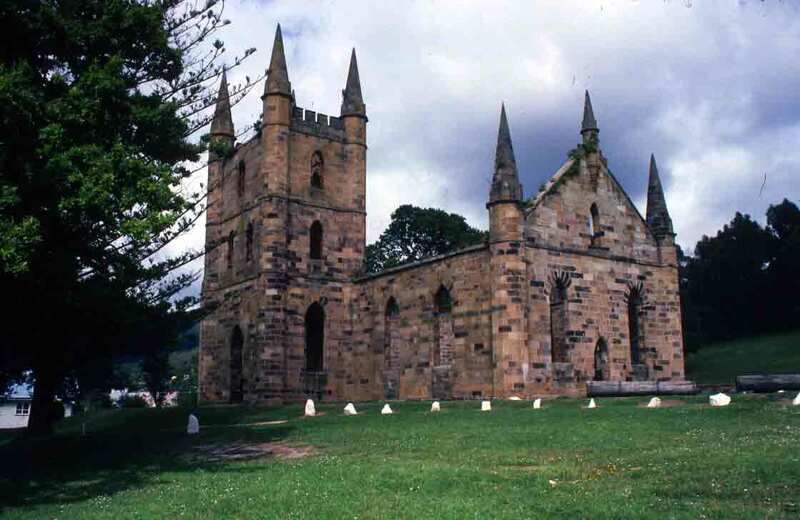 The church at Port Arthur is not the largest building on the site, but it is among the most handsome and certainly seems to be the most frequently photographed. It was not simply convict built, but was also convict designed. It has a decidedly Gothic feel to it. It doesn’t look like a terribly large building, but I’ve read that it could accommodate 1,000 people. Interestingly, because it served people of so many denominations, it remained a non-denominational church—one of the first in Australia. The timber roof was lost more than 100 years ago to a fire, but the solidly built stone walls remain. After exploring the museum and asylum, I headed for the Model Prison. The prison was so called because it was considered a model of new techniques and ideas that were being tested. Here, the lash was abolished, and solitary confinement was introduced for the most murderous prisoners. For those not in solitary, there was education and training in job skills. 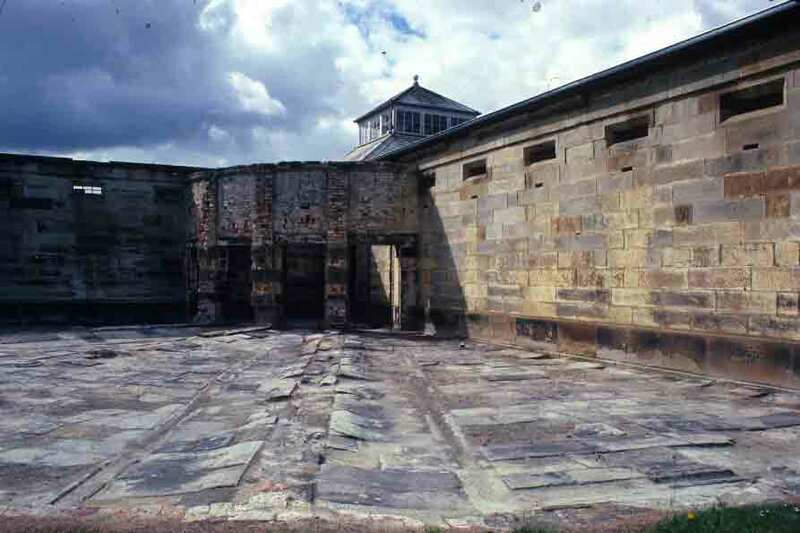 As I noted in the previous post, the Penitentiary was more a place for reformation than for punishment. The Model Prison, on the other hand, was for punishment. Hardened criminals went to the Model Prison, while pickpockets, vagabonds, streetwalkers, and other relatively minor offenders went to the Penitentiary, thus reducing the likelihood of really bad behavior being spread through the population. 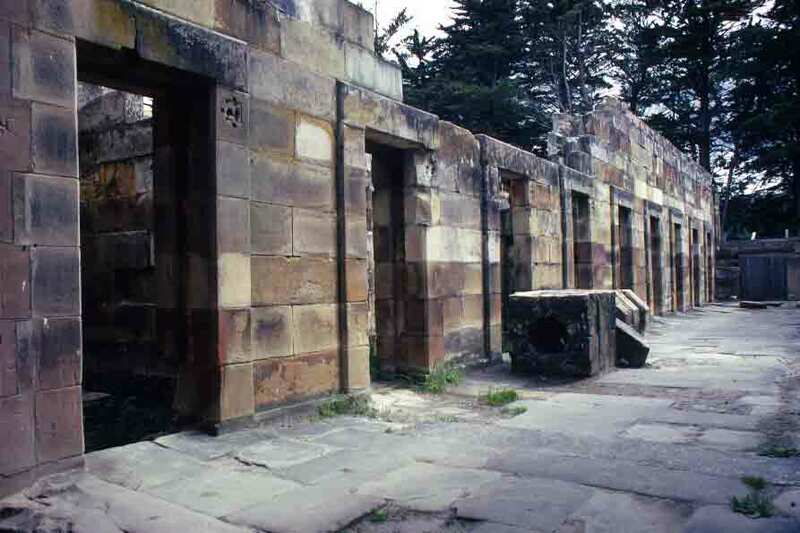 The thing that really astonished me about the Model Prison, and indeed about the buildings at Port Arthur in general, is how tremendously solid, well-constructed, and attractive everything was. The concept of shipping a bunch of convicts, soldiers, and administrators to the far side of the planet, dropping them on a narrow, rugged peninsula on an untamed island off the coast of a remote wilderness, and having them cut stone and design and construct buildings that were so clearly created to be impressive and to last a long time—well, it’s just amazing to me. The image on the left shows the interior of the Model Prison, while the one on the right shows the exercise yards that radiated out of the center of the prison. The word penitentiary was first used to mean “house of correction” in 1806. So when the Lieutenant Governor of Tasmania (known at the time as Van Diemen’s Land) decided to consolidate the colony’s penal settlements into one location, the inclusion of a penitentiary was fairly novel. In fact, the rise of the penitentiary was part of the reform movements of the era, when reform societies were working to change and improve the lots of people trapped in lives of poverty or crime. The word was originally used to describe an asylum for prostitutes, where the women were not prisoners, but were actually given a safe haven, where they could be educated and reformed, so they could return to society. Many of the penitentiaries of this era were tremendously successful. (The word penitentiary came from the idea of rescuing penitents, those who regretted their lifestyles and wished to change.) Soon, the idea grew from rescuing prostitutes to rescuing anyone who wanted to escape a life on the streets. 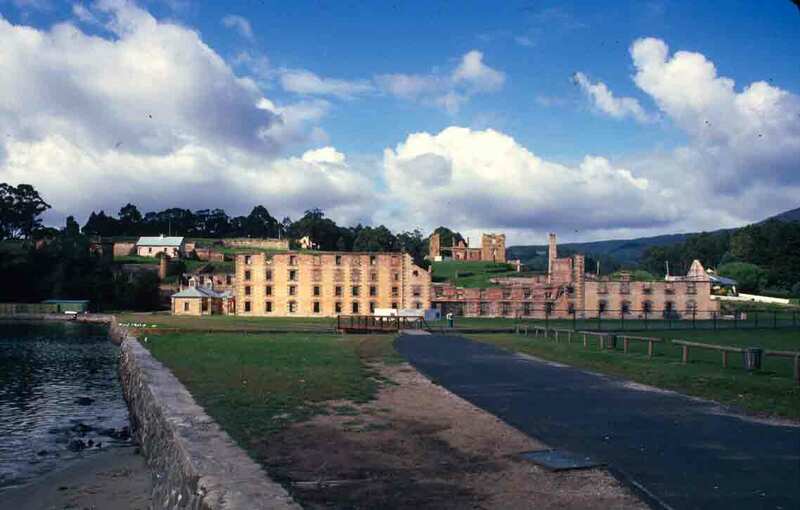 In the photo of the Port Arthur settlement below, the penitentiary is the massive building that dominates the scene.